﻿ The Fullerton Hotel, Singapore | FROM $198 - SAVE ON AGODA! "The roof top bar has a terrific view across the bay to Marin..."
Have a question for The Fullerton Hotel? "Service staff were wonderful - extremely helpful and polite." "A lot of staffs were really excellent such as reception and restaurant staffs." "The location is very good to go anywhere for sightseeing and we were very satisfied with the atmosphere of this hotel." 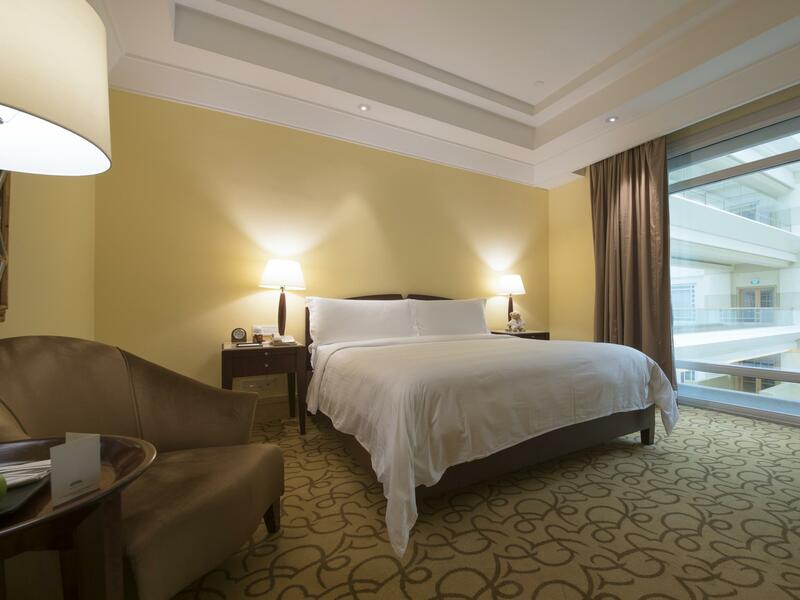 "Highly recommend The Fullerton for its attentive service sta..."
Enjoy a 5-star holiday with your family and spend your down time in the lap of luxury at the Fullerton Hotel. Rated 5 stars, this Singapore hotel offers you everything you would want for a luxurious vacation. Looking out at the river, sea, city, and courtyard, it provides impressive scenery. It is near places of interest such as Ashley Isham, Cavenagh Bridge, Asian Civilisations Museum, Dalhousie Obelisk, and Anderson Bridge. With tours available, the Fullerton Hotel is a great place to stay to learn about your surroundings and see everything you can while you're here. Massages are available, so if you want to spend your day simply relaxing and unwinding, you can treat yourself like royalty. This Singapore hotel has numerous convenient features, such as safety deposit boxes, a currency exchange, an infirmary, a salon, as well as a laundromat. Featuring a fitness center, a spa, an outdoor swimming pool, and a sauna, it has everything you could need to make your stay as comfortable as can be. It has a kids club, offering traveling parents a fun-filled and entertaining childcare resource. From a bar to a poolside bar, this Singapore hotel has a selection of dining and snacking choices. There's free Wi-Fi in all rooms, as well as Wi-Fi in common areas, connecting you to the web so you don't need to purchase a local sim card or spend on international charges. The Fullerton Hotel provides a range of useful services, such as a concierge, daily housekeeping, as well as a babysitting service. All of the rooms come with air conditioning, an in-room safe box, bathrobes, and a bathtub, as well as linens, towels, a coffee or tea maker, a wake-up service, and other amenities. The front desk is open around the clock, ensuring that there is always someone on call to answer any questions you may have. Hotel staff speaks English, Japanese, Tamil, Cantonese, Korean, and more. This Singapore hotel allows pets, saving you the trouble of finding someone to look after your pet while you're away from home. 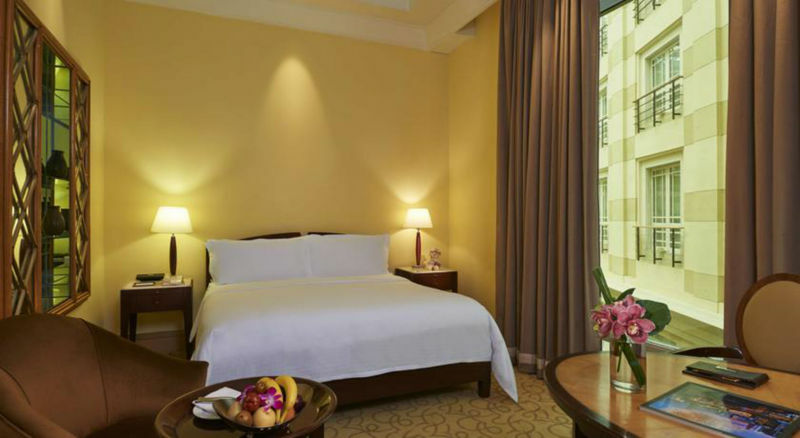 The Fullerton Hotel provides express and private check in and check out, allowing you to conveniently choose the option that best suits your schedule. This Singapore hotel offers check-in from 03:00 PM and check-out until 12:00 PM. It offers a variety of transportation options, such as airport transfers, car rentals, and shuttle services. Raffles Place MRT Station is 310 m away and Telok Ayer MRT Station is 680 m away. "Location is great, nearby MRT." Please note that the primary guest checking in must be at least 21 years of age. This is a 100% Smoke Free hotel. There will be designated smoking areas within the hotel. To ensure a refreshing stay experience for the guests, the hotel will imposed cleaning fee for violations. It was our third stay. However, there were some disappointment on our latest stay. First, upon check-in (Room 577) we discover that the tablet wasn’t working. Secondly, we discover that some of the sockets could not be utilize. Overall, I would say that is was a pleasant stay as the dinner buffet somehow make it up to it. Cheers! We arrived to messy check-in area where there were no definitive queues. However, we later understood from Gladys that many guests were only there to retrieve their key cards and she had tried to identify those guests who were arriving for check-in. Service was fantastic from then on, with friendly staff, great big rooms, comfy beddings, beautiful CNY decor and yummy breakfast buffet. Was also surprised that a cake was placed in my mum's room as it was one day past her birthday. Mum even requested to stay over again the next time we plan a staycation. Love this hotel. It is in a fantastic position and it is such a beautifully renovated building. The rooms are gorgeous and the staff are helpful and friendly. Breakfast is beautiful with a huge selection of food. Will definitely be booking here again when I am next in Singapore. Lovely welcome when I came back on Tuesday. Hotel looked wonderful beautifully decorated for Christmas. I didn’t have to wait for my upgraded room very nice reception staff and escorted up to my room. Small touches count and being welcomed back as a loyal guest. I love coming to stay here in this beautiful heritage hotel. Next visit will be in March and again in April. Happy Christmas and a very Happy New Year to the Fullerton team. See you in early 2019. Wonderful hotel in a great location of Singapore. Not cheap but worth the money. We were looking at another well known hotel in Singapore known for its sky pool but after visiting this other hotel for drinks we were pleased we chose the Fullerton. Treat yourself and stay at the Fullerton, you won’t be disappointed. Paid for Straits Club lounge benefits for 2nts. Little disappointed with food selection on 4th floor, compared to other hotels with same benefits. However enjoyed much better selection in main restaurant (breakfast). Staff in Straits Club were very attentive (Paolo especially) and we’re able to assist with any questions, issues, local knowledge and speedy check out. Thanks again! I stayed this hotel about three days.The hotel facilities and staffs were so nice but when i back to hotel from sightseeing,there were two hotel staffs in my room. and I asked "could you take it(water bottle...and some trash) away?" and cleaning staff didn't answer and took the trash. after that, he said to other hotel staff(next to him)"this water bottle is not empty,thats why i didn't take it..blah blah.."in chinese. maybe he thought I couldn't understand chinese.but I totally understood what he said. this hotel is five stars. I think they must improve the hospitality skills more and more.and after cleaning I found the cups were not cleaned up. A lot of staffs were really excellent such as reception and restaurant staffs. cleaning staffs also should be five stars. The location is perfect.... Easy to reach. It is in the downtown area... Nice rooms, elevator, good breakfast, clean. Staff were extremely helpful, courteous and knowledgeable. The service is amazing. I would stay at this hotel again. The room is neat and clean. Great design of the room. The room is comfortable in any ways. The facilities are beyond expectations. we booked the rooms in Fullerton hotel to prepare for our wedding and as a rest spot for our post wedding recharge. we were very well taken care of. the hotel and staff took special attention to our needs for the wedding and were flexible in accommodating to our unforseen last minute request. they were also responsive in our message exchanges through agoda. the amenities and facilities provided is also first rate and of impeccable quality. I had a very good stay. Lovely iconic hotel, the staff can’t do enough for you. Some of them even remember me and make a point of knowing my name. Anything you raise it is dealt with in a very professional way. I recommend the Singapore Sling! The Christmas decorations are lovely! The music of the piano, violins in the evening is so beautiful from the balcony. I just love coming back. And back again in three weeks time for a couple of nights. Beautiful hotel, kids friendly ( provided baby cot, baby bath toiletries, colouring stuff, puzzles) for kids and could redeem free ice cream for them. Lovely staff and efficient service! Love our staycation.!! The location is great Easy to reach. It is in the downtown area.. The staff are friendly and nice. The service is amazing. I would stay at this hotel again. The room is neat and clean. Great design of the room. Hospitality at its best. Great stay at the Fullerton with very spacious courtyard rooms. Very good tv channel selection. Very good choice for staycation. However my only gripe is they fail to delivery the complimentary birthday cake that was promised by the reservation team. I chose this hotel mostly because I saw how beautiful it was at night. After having been there, now I love it for its great location and staff. It is so ideally located allowing you to walk to so many places and the area was nice to take strolls at night. My first interaction with the staff was via email prior to my arrival, and they were very considerate and professional. They were helpful throughout my stay and I would really like to come back to this hotel again. Walking distance to Boat Quay and Clarke Quay and the Elizabeth Walk, MRT. A grand looking historic building (former Post Office) beautifully lit at night. Only downside was the one way Singpaore streets which meant that the taxi had to go around a bit to get in and out of the hotel! The hotel overall is good like the other 5 star hotel but the service is not like other hotel with the same level. This is the first time I did not get request. I think the hotel had different service between guest booking from agent and direct from hotel. Anyway, the staffs in restaurant are rather well.